====Goals: photo bio reactor continuous, integrated and compact system for the cultivation of microalgae; ====Usable in: small manufacturers of food and agricultural sectors, as well as urban and peri-urban settlements, pharmaceutical, chemical and cosmetic industry, oil/petroleum and green chemical industry, agricultural and food chain industry. ====All IP set: Link . ====This invention relates to a method and to a device to implement said method, to cultivate microalgae and to obtain the simultaneous separation of oleic and protein parts, reducing the required space and drawing mainly from renewable energy sources. The method is characterized by the fact to include the following phases: â€¢ said watery mixture, containing said inoculum, follows a path (B) from an inlet point (C) to an outlet point (D), along which it is irradiated by a radiation spectrum suitable to the development and the growth of said microalgae; â€¢ along said path (B) they are added NPK salts (containing nitrogen, phosphorus and potassium) and CO2, these additions, together with the diffusion of said radiation spectrum, causing an intense growth of said algae; â€¢ said mixture, strongly enriched of microalgae, is flooded by the ultrasounds that destroy the grown-up algae, splitting them in oleic and in protein components, said action causing the formation of a new watery mixture in which a oleic fraction and a protein fraction are present; â€¢ said new watery mixture undergoes a spontaneous gravimetric separation in such a way that: â€¢ a oleic fraction, lighter, migrate in the upper part of said new mixture; â€¢ a protein fraction, heavier, migrate in the lower part of said new mixture; â€¢ a neutral fraction composed almost exclusively of water remains in the intermediate part of said new mixture; Â· said three fractions are individually taken. The device (A) is characterized by the fact to include: â€¢ a basin (1) fitted to contain said watery mixture; â€¢ one or more baffles (3, 4, 5) fitted to delimit a path (B) from a point (C) to point (D), said one or more baffles (3, 4, 5) being homogeneous diffuser panels of radiation spectrum suited to the cultivation phase; â€¢ means fitted to provide, to said fluid mixture, NPK salts nitrogen, phosphorus and potassium salts) and CO2, said means being arranged along said path (B); â€¢ means (9) fitted to produce ultrasounds, positioned at the final point (D) of said path (B), said ultrasounds being of sufficient power to destroy the grown-up algae splitting them in oleic and protein components, giving rise to a new fluid mixture in which there are present a oleic phase, a protein phase and a neutral phase; â€¢ means fitted to diffuse said new fluid mixture, in order to carry out a gravimetric separation of said oleic, protein and neutral phases; â€¢ means fitted to separately collect said oleic, protein and neutral phases. 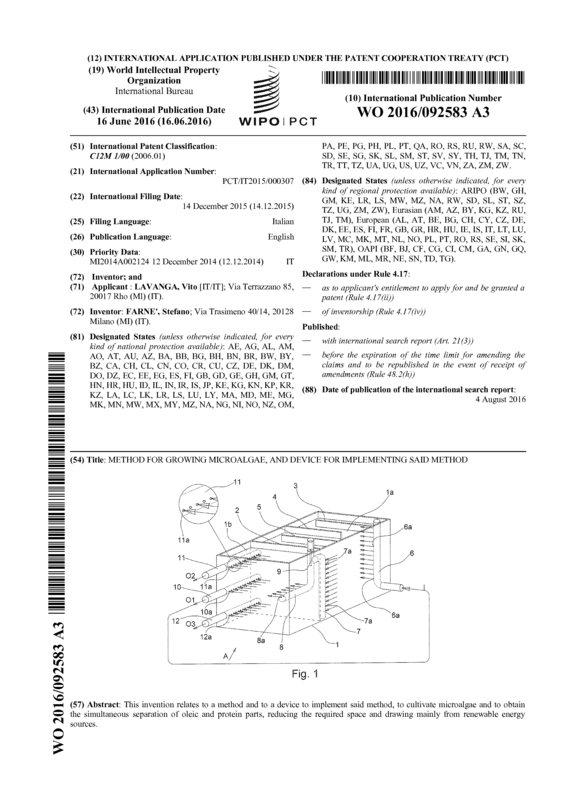 Page created at 2019-04-26 5:57:08, Patent Auction Time.